Chapter VII. Internal Will and Understanding, and External Will and Understanding. 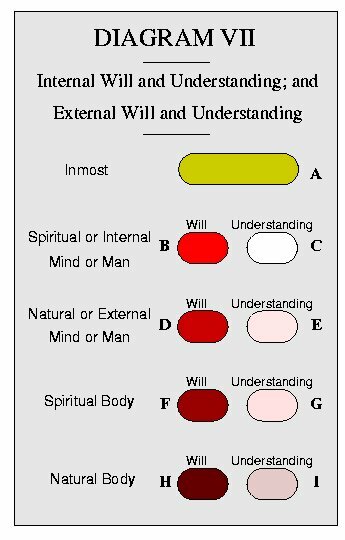 THE internal will and understanding B and C pertain to the spiritual mind, the external will and understanding, D and E, to the natural mind, as shown in this diagram. The external will and understanding may be either conjoined with the internal and act in harmony with them, or be severed from them and act in opposition. In a state of order the external will and understanding are in agreement and co-operation with the internal and are conjoined with them, so that they constitute as it were one will and understanding. With the wicked, the spiritual will and understanding, although never perverted, are yet closed and quiescent; but their natural will and understanding, though open and operative, are defiled with evil and falsity and severed from the spiritual, and hence act in opposition to them. The will and understanding are here presented as organic faculties of the mind; the external organism being an outbirth from the internal. Their varying states will be presented in other diagrams. The will is drawn in red because it is the receptacle of love, the understanding in white because it is the receptacle of truth. Chapter V. Will and Understanding. – Another View. 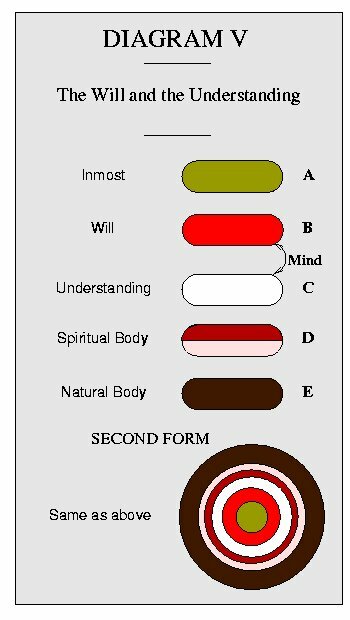 Considering the will as the highest and inmost degree and the understanding as the middle, the spiritual body D will be the lowest or outmost degree of the spirit. The spiritual body, however, is not another faculty, but merely an ultimate of the will and the understanding, so organized that by it the will and the understanding may enjoy outward sensation and give expression corresponding with affection and thought. In this view the mind constitutes the whole spirit of man, and the spirit is but an internal and an external will and understanding. “He who has an ear, let him hear what the spirit says to the churches” (Revelation 2:7). Our text occurs seven times in the second and third chapters of the book of Revelation. It is the concluding exhortation of each of the messages to the seven churches. Indeed, the Lord frequently ended His instruction to the Jews by saying: “He who has ears to hear, let him hear … ” (Matt. 11:15, et alia). The fact that this phrase and similar admonitions occur frequently throughout both the Old and the New Testaments warrants our consideration of its purpose and meaning. In the Arcana Coelestia we are told that “to hear” in the Word does not mean simply the physical act of hearing, but rather the reception of that which is heard, first in the memory, next in the understanding, then in the will, and finally in the life (AC 9311). Two of the five senses, we are told, especially serve man in perfecting the mind: the sense of sight and the sense of hearing. These are also the primary senses involved in man’s reformation and regeneration, for they are formed to receive those things which contribute to this end. The things which enter the mind through the sense of sight enter the understanding and enlighten it. For this reason when “seeing” is mentioned in the Word and it is frequently mentioned it refers to the enlightenment of the understanding. However, the things which enter through the sense of hearing enter both the understanding and the will, and for this reason when “hearing” is mentioned in the Word it refers to perception and obedience (see AE 14). That “seeing” refers to understanding and enlightenment, and “hearing” to perception and obedience, is evident from ordinary speech. When we want to know if something is understood we ask: “So you see what I mean?” And if it is understood the answer is given: “Yes, I see.” Also we say of a person endowed with an unusual intelligence that he or she is bright or brilliant. Or if a person is low in intelligence we say he or she is dull. “Dull,” “bright,” and “brilliant” are attributes of light, and thus of sight. That “hearing” refers to perception and obedience is also clear from ordinary speech. When somebody has been explaining something to us which he considers important, and we get the message, we say: “I hear.” Or, when we are trying to exact obedience from a child in a certain matter, we end by saying: “Do you hear me?” And if the answer is “Yes,” we expect obedience from that child. These expressions, we are told, flow down into human speech out of the spiritual world, where man’s spirit is, by correspondence. Furthermore, in the Grand Man of heaven, those who are in the province of the ear are in obedience from perception. This province is said to be the axis of heaven, that is, the whole of the heavens have direct relation to those who are in obedience from perception because the ruling perception of heaven is that if a thing is true it must be done (see AE 14; AR 87). In communication between people the function of the ear is to receive the speech of another and convey it to the mind so that we can perceive what is in the mind of the other person. Thus “to hear” is to perceive. The function of hearing is to transfer what a person is speaking from his thought, into the thought of another, and from his thought to his will and from the will into deed. Therefore to hear also involves obedience. The circle of communication, then, is from the will into thought, and so into speech, and from speech through the ear into another’s thought and will (see AC 5017). The most important of all communication is that which exists between the Lord and mankind. And the medium of this communication is the Word. The Lord’s ardent love for the eternal happiness of mankind descended into His thought and from His thought into words, which were communicated to those who were prepared by the Lord for the office of revelator, who wrote them down. For the circle of communication to be completed these words must be conveyed to the understanding of man and from the understanding to the will, and from the will into life. When the Lord’s love is received in a person’s will, conjunction between the Lord and that person takes place. It is not enough that the Lord’s wisdom contained in the Word be communicated to our understanding; this merely produces presence but not conjunction. This is the reason the Lord has established a church and instituted worship so that His Word may be heard, that there may be an appeal to the very will itself. Thus in the church we have the written Word and the spoken Word. To develop our understanding we should read the Word and presentations on its Divine doctrine and reflect calmly and deeply on their meaning. In this way we will grow in spiritual intelligence. But if we wish to grow in wisdom also, we should hear the Word read and preached. In hearing there will be, or should be, an added appeal to the affection. Thus it should enter into our will and from that into our life where the will is terminated and made permanent. In His wisdom the Lord has provided that the mind of man may be reached through both of these senses through “seeing” and “hearing.” The written Word is almost devoid of emotion except for the emotion which the words themselves convey. Thus the intellect is appealed to so that the mind can come to know, understand, and believe the truth which the Lord teaches, simply because it is true. The spoken Word is then added to appeal to both the intellect and the will. The ideas expressed by the words are received in the understanding but the tone of voice and the inflection affect the will, so that what is said may be received in the will and cause a person to do that which is heard. From this we may see that there is a use and a need for both kinds of communication, and we can see what our response to both should be. We are taught in the Word that to hear the voice of the Lord means to obey what is proclaimed from the Word; and that they who do so become rational and spiritual, but that they who do not become sensual and corporeal. “Those become … sensual and corporeal,” we read, “who have … known the things of the spiritual world and have afterward rejected them, and have imbued themselves with principles of falsity contrary to truths; and as to life, have looked solely to worldly, bodily, and earthly things, and from this have believed that life ought to be enjoyed with every pleasure, saying: `What has man more while he lives? When we die we die!’ … If anyone by rational arguments sets them thinking at all about eternal life, they think that they shall fare no worse than others, and immediately relapse into the state of their former life. “With such there is a closing of the passage for the light of heaven and its influx, and light of heaven in their natural becomes thick darkness, but the light of the world … becomes brightness, and the brightness is so much the more brilliant as the light of heaven is more darkened; hence it is that such see no otherwise than that the evils of their life are goods, and that consequently the falsities are truths. It is from this then that a person becomes sensuous and corporeal” (AC 6971). In other words, if we do not obey what we hear from the Word, we degenerate. Instead of becoming rational and spiritual, we become sensual and corporeal our minds are darkened and our will vitiated. Compare this state with that of the angels of the celestial heaven. The wisdom of the angels of the inmost heaven consists in wishing to be led by the Lord and not by themselves, in loving what is good and delighting in what is true. Because they love nothing so much as being led by the Lord, whatever they hear from the Lord, whether through the Word or by means of preaching, they do not store in the memory but instantly obey it, that is, will it and do it (see HH 278). “In that heaven, love to the Lord is willing and doing Divine truth” (HH 271). To find the answer to this question we should ask ourselves more particular questions. To what extent have we allowed the truths we have heard to enter into and change our lives? What is our usual reaction to the truths we hear preached? Do they enter only as far as the external ear and then vanish beyond recall? Are we momentarily stirred but cannot remember several days later what it was that moved us? Or do we see and perceive an important truth a truth which, if lived, can change our lives and make us better men and women? Do we will that truth and determine within ourselves to obey it? Speaking generally, the purpose of a sermon is to draw a particular truth from the Word, to put it into perspective by showing its relationship to other truths, to examine it from several different aspects so that its nature and quality may be perceived, and to indicate the application of that truth to life. A sermon is not preached merely to uplift and soothe, nor is it intended to upset or depress the congregation, and certainly it is not to weary them. The Word is studied and its truth presented with the hope that it may be received, perceived and obeyed. In the Arcana Coelestia where it treats of the reading of the covenant by Moses to the Children of Israel, we are told that to “read in the ears of the people” signifies hearkening and obedience. For when anything is read, it is that it may be heard, perceived and obeyed (AC 9397). In the passage from the Apocalypse Revealed which we read for a third lesson, we are assured that if we read the doctrine of the New Jerusalem with a desire to know that doctrine, if we hear the things which are taught from it, and if we live according to it, then we will be blessed. We will be, as to our spirits, in communion with the angels of heaven even while we live on earth (see AR 8). What, then, should be our attitude and response to the reading of the Word and the preaching from it that we regularly hear in Sunday worship? The nature of our response is clearly indicated in the Word itself. We should say in our hearts with conviction and determination: “All that the Lord has spoken we will do and hear” (Exodus 24:7). Amen. Verse 3. “Blessed is he that readeth, and they that hear the words of the prophecy, and keep the things which are written therein” signifies the communion of those with the angels of heaven, who live according to the doctrine of the New Jerusalem. By “blessed” is here meant one who as to his spirit is in heaven; thus, one who, while he lives in the world, is in communion with the angels of heaven; for as to his spirit he is in heaven. By “the words of the prophecy” nothing else is meant than the doctrine of the New Jerusalem, for by “prophet” in the abstract sense is signified the doctrine of the church derived from the Word, thus here the doctrine of the New Church, which is the New Jerusalem; the same is signified by “prophecy.” By “reading, hearing, and keeping the things which are written therein” is signified to desire to know that doctrine, to attend to the things which are in it, and to do the things which are therein; in short, to live according to it. That they are not blessed who only read, hear and keep or retain in the memory the things which were seen by John is evident (n. 944). The reason why “a prophet” signifies the doctrine of the church from the Word, and “prophecy” the same, is that the Word was written through prophets, and in heaven a person is regarded according to that which belongs to his function and office. From this also is every man, spirit, and angel named there. Therefore, when a prophet is mentioned, because his function was to write and teach the Word, the Word is meant as to doctrine, or doctrine from the Word. Hence it is that the Lord, because He is the Word itself, was called the Prophet (Deut. 18:15-20; Matt. 13:57; 21:11; Luke 13:33). To show that by “prophet” is meant the doctrine of the church from the Word, some passages shall be adduced, from which this may be collected. In Matthew: “In the consummation of the age many false prophets shall rise up and shall seduce many. There shall arise false Christs and false prophets, and, if it were possible, they shall lead into error the elect” (Matthew 24:11,24). “The consummation of the age” is the last time of the church, which is now, when there are not false prophets but falsities of doctrine. In the same: “He that receiveth a prophet in the name of a prophet shall receive a prophet’s reward; and he that receiveth a just man in the name of a just man shall receive a just man’s reward” (Matthew 10:41). “To receive a prophet in the name of a prophet” is to receive the truth of doctrine because it is true; and “to receive a just man in the name of a just man” is to receive good for the sake of good; and “to receive a reward” is to be saved according to reception. It is evident that no one receives a reward, or is saved, because he receives a prophet and a just man in the name of such. Those words cannot be understood by anyone without a knowledge of what “a prophet” and “a just man” signify; nor can those which follow: “Whosoever shall give to drink unto one of these little ones a cup of cold water only, in the name of a disciple, shall not lose his reward.” By a “disciple” is meant charity, and at the same time faith from the Lord. In Joel: “I will pour out my spirit upon all flesh, so that your sons and your daughters shall prophesy” (Joel 2:28). This is concerning the church which was to be established by the Lord, in which they would not prophesy but receive doctrine, which is to “prophesy.” In Matthew: “Jesus said, Many will say to Me in that day, Lord, Lord, have we not prophesied in Thy name? but then will I confess unto them, I have not known you; depart from Me, ye that work iniquity” (Matthew 7:22, 23). Who does not see that they will not say that they have prophesied, but that they knew the doctrine of the church, and taught it? In the Apocalypse: “The time is come for judging the dead and for giving reward to the prophets” (Rev. 11:18); and in another place: “Exult, O heaven, and holy apostles and prophets, for God hath judged your judgment” (Rev. 18:20). It is evident that a reward would not be given to the prophets alone, and that the apostles and prophets would not alone exult at the Last Judgment, but all who have received the truths of doctrine and have lived according to them. These, therefore, are meant by “apostles” and “prophets.” In Moses: “Jehovah said unto Moses, I have made thee a god to Pharaoh, and Aaron thy brother shall be thy prophet” (Exod. 7:1); “a god” here means the Divine truth as to reception from the Lord, in which sense the angels are also called gods, and by “prophet” is meant one who teaches and speaks it, therefore Aaron is there called a prophet. The same is signified by “prophet” in other places, as in Jer. 18:18; 23:15,16; 5:13; Isaiah 28:7; Micah 3:6; Jer. 8:10. In these passages, by “prophets” and “priests,” in the spiritual sense, are not meant prophets and priests, but the entire church, by “prophets,” the church as to the truth of doctrine, and by “priests” the church as to the good of life, both of which were destroyed; these things are so understood by the angels in heaven, while by men in the world they are understood according to the sense of the letter. That the prophets represented the state of the church as to doctrine, and that the Lord represented it as to the Word itself, may be seen in The Doctrine of the New Jerusalem concerning the Lord (n. 15-17).